This egg foo young is deep-fried, which is the way it was originally served in restaurants in the 1950s. Pork or chicken can be used instead of shrimp. To prepare the sauce, bring the chicken broth to a boil. Stir in the seasonings and thicken with the cornstarch-and-water mixture. Keep warm on low heat while making the egg foo young. Rinse the shrimp under warm running water. Pat dry and finely chop. Rinse the mung bean sprouts and drain thoroughly. Cut the red bell pepper in half, remove the seeds and cut into bite-sized chunks. Wipe the mushrooms clean with a damp cloth and thinly slice. Wash and finely chop the green onions. Heat 2 tablespoons of oil in a frying pan. When the oil is hot, add the shrimp. Stir fry until they turn pink and are cooked through. Remove from the pan. In a large bowl, lightly beat the eggs with the salt and pepper. Stir in the rice wine or sherry, cooked shrimp, and the vegetables. In the wok, heat 2 1/2-inches of oil for deep-frying to 375 F. When the oil is hot, carefully ladle 1/4 of the egg mixture into the wok. Deep-fry on one side until browned for about 2 minutes, then ladle a bit of oil over the top so that it firms up. Use a spatula (or 2 spatulas if necessary) to gently turn the omelet over and brown the other side. Remove the omelet with a slotted spoon and drain on paper towels. 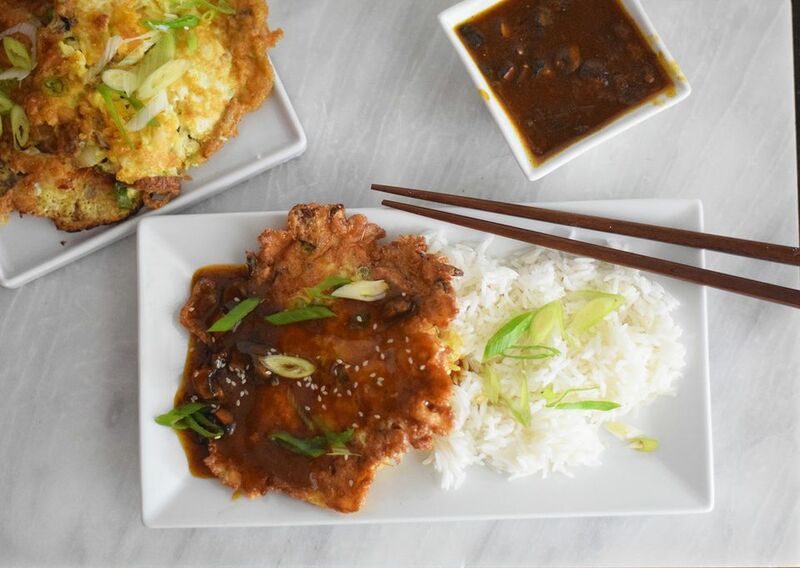 Serve on a plate with the egg foo young sauce poured over top or on the side.